We’d love your help. 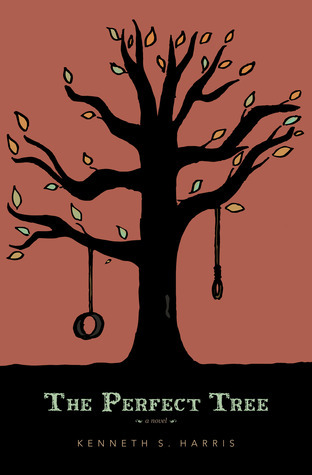 Let us know what’s wrong with this preview of The Perfect Tree by Kenneth S. Harris. Blake Kiser is a 12-year-old boy who has given up his latest summer to help out more around the farm. It's not like he has much else to do though—his best friend, Matt, has moved away, leaving Blake more alone than ever, until Greta arrives. Gretchen Wills is a bit of an oddity, who stands out even more in the quiet country town of Hemingford, like a firefly in a dark base Blake Kiser is a 12-year-old boy who has given up his latest summer to help out more around the farm. It's not like he has much else to do though—his best friend, Matt, has moved away, leaving Blake more alone than ever, until Greta arrives. Gretchen Wills is a bit of an oddity, who stands out even more in the quiet country town of Hemingford, like a firefly in a dark basement. But like every firefly, shine too bright and you're bound to get caught. Blake shows Greta some of Hemingford's local color, including the old Bradley House—a house every kid in Hemingford believes to be haunted. They are enthralled by the broken-down shack and the eerie tales that surround it—stories of the man who used to live there. But they find something much more concrete than ghosts waiting within: a crude man who becomes a very unlikely friend. But as wicked crimes are committed throughout the rural community, Blake witnesses the quiet town of Hemingford transform into something ugly he doesn't recognize—and suddenly, childish fears of ghosts and monsters seem irrelevant in the wake of true, tangible danger. To ask other readers questions about The Perfect Tree, please sign up. The Perfect Tree is a ‘coming of age’ story. It captures the feelings of childhood perfectly—that stage in life when you’re still a kid, but you’re making the transition into the teenage years. The characters of Blake and Greta act and think like real children and I think this is what kept me so very intrigued. I love a book that portrays a child as a child, with child-like thoughts, not adult thoughts. It reminded me of my childhood; the innocence, the carefree days, and the first tender feelin The Perfect Tree is a ‘coming of age’ story. It captures the feelings of childhood perfectly—that stage in life when you’re still a kid, but you’re making the transition into the teenage years. The characters of Blake and Greta act and think like real children and I think this is what kept me so very intrigued. I love a book that portrays a child as a child, with child-like thoughts, not adult thoughts. It reminded me of my childhood; the innocence, the carefree days, and the first tender feelings of young love. The relationship between Blake and Greta is endearing. The Perfect Tree has a ‘feel’ to it, a certain ambiance that stayed with me after I finished the book. I know this is a somewhat cliché concept, but I couldn’t stop thinking about it for days afterwards. In essence, the young characters are intrigued by a ‘haunted house’ said to be inhabited by a ghost. I assumed the book was going to be some kind of ghost story and I felt that tingly anticipation as my heart raced that little bit faster. Sorry, no spoilers! However, the characters soon find that there are many things in life that are worse than ghosts. The innocence of childhood ends and their eyes are ‘opened.’ I greatly enjoyed the book and it’s an easy five star rating. And the ending—well, the ending is AMAZING. I wanted more! I found myself daydreaming about what happened next. Again, no spoilers. You’ll have to read it! It’ll be worth your time. This is a beautifully-written story set in rural America of two children who meet by chance. Blake has worked on his parents' farm all his life, while Greta has recently moved from the city. Both outcasts, they develop a close friendship. This coming of age story is written from the children's point of view, and the author manages to write their thoughts and feelings in such an open, honest way that you feel as if they are real people and not characters in a book. Their childhood innocence is ab This is a beautifully-written story set in rural America of two children who meet by chance. Blake has worked on his parents' farm all his life, while Greta has recently moved from the city. Both outcasts, they develop a close friendship. This coming of age story is written from the children's point of view, and the author manages to write their thoughts and feelings in such an open, honest way that you feel as if they are real people and not characters in a book. Their childhood innocence is abruptly taken from them when a series of events overturns their lives, and they discover that they cannot always believe what they see. The narrative is so good that the reader feels the characters' delusion, anger, sadness and fear as the events develop. And there is a twist on the very last page that will shock you to your core, while leaving you to make up your own mind. Very clever. This is one of the best books I've read in a while. It really held my interest and I didn't want to put it down. I loved the way I saw the world through a child's eyes and felt as if I were right there with Blake and Greta. I liked how you can see that the world isn't all flowers and rainbows. The ending actually surprised me. Very good twist at the end. I won't spoil it and tell you how it turns out. ;) Overall, excellent read! If you are looking for a story that will grip you, get this book. I am not one normally to get drawn into a story but this one did the trick. You will find yourself growing to love the main character, Blake and Greta. With twists and turns every step of the way I was not able to put it done. I hope the author has other works in mind I can't wait to read them. There were a couple of little inconsistencies that bothered me with this book. An unknown girl was at one point referred to as an unknown boy. The main character claimed he didn't have an aunt living in the area and then shortly after it's revealed that he does. Times to travel distances were more story (so certain events could happen after dark) -convenient than real - eg it took the two kids over 8 hours to walk to a house (they left at 7:30 am and arrived some time before dusk). They then wal There were a couple of little inconsistencies that bothered me with this book. An unknown girl was at one point referred to as an unknown boy. The main character claimed he didn't have an aunt living in the area and then shortly after it's revealed that he does. Times to travel distances were more story (so certain events could happen after dark) -convenient than real - eg it took the two kids over 8 hours to walk to a house (they left at 7:30 am and arrived some time before dusk). They then walked home again in the dark in a shorter time frame. Next time they decided to ride to the house, but that took almost as long, but then it was later said that riding took 1.5 hrs and driving 20 minutes. This book starts off in first person with a little girl who writes poetry and is encouraged by an elderly man to continue her writing. Then one day he seems to disappear. Then it jumps to a separate character and further into the future with a little boy named Blake. It takes you on twists and turns of this little boy’s life as he meets a girl, who’s his neighbor, and they become fast friends. They encounter bullies, creepy houses, a man living an abandoned house and other normal type life stuff This book starts off in first person with a little girl who writes poetry and is encouraged by an elderly man to continue her writing. They encounter bullies, creepy houses, a man living an abandoned house and other normal type life stuff. I really enjoyed this book! I don’t normally read a book that has no paranormal type stuff, but I really liked the perfect tree. separate character since I was growing attached to the little girl already. As I read about Blake though, I soon got caught up in his story. unique. I felt like at times I was reading a book from the 1800’s, and then other times it felt very modern, and I really like that about it. When I started this, I expected a traditional coming of age story with such a young set of characters but what you end up getting is an exploration of what trust is, what humans are capable of, and just how love can help overcome tragedy. Despite the youth of the characters, their maturity jumps off the page and you are left wishing that you had been that cool when you were in middle school. It'll leave you guessing until (quite literally) the last sentence. Blake and Greta have to handle some o When I started this, I expected a traditional coming of age story with such a young set of characters but what you end up getting is an exploration of what trust is, what humans are capable of, and just how love can help overcome tragedy. Despite the youth of the characters, their maturity jumps off the page and you are left wishing that you had been that cool when you were in middle school. It'll leave you guessing until (quite literally) the last sentence. Blake and Greta have to handle some of the worst things that can happen to people but they do it with grace and love. It's a short read but it's packed with plot. I found myself floundering a little bit when it came to becoming emotionally attached to characters outside of Blake or Greta, which made some of the events fall a little bit flat but I think that just stemmed from such a strong attachment to the leads. There were also a few typos and tiny plot holes that threw me as I'm an editor at heart, but nothing that you can't look past. I would warn that this is a book to share with someone who is mature enough to handle exceptionally adult topics, don't be fooled by the youth of the mains. If you're capable and willing to tackle tough topics, this story does so with great care and it's so well worth a read. I'll be wondering what becomes of these characters for months to come which is always the sign of a great piece of literature. Overall, I'm impressed. A good book, well written. I was blown away by the quality and accuracy of the first two chapters (from memory, certainly the first chapter). Writing was strong, use of language and flow very refreshing. I could see a lot of effort had been made to get these chapters flowing. Like a child passing themselves of as a grown up, the book takes a similar transition not long after those opening scenes. We're in the heads of a 12 and 10 year old for the most part. Errors do then Overall, I'm impressed. A good book, well written. I was blown away by the quality and accuracy of the first two chapters (from memory, certainly the first chapter). Writing was strong, use of language and flow very refreshing. I could see a lot of effort had been made to get these chapters flowing. Like a child passing themselves of as a grown up, the book takes a similar transition not long after those opening scenes. We're in the heads of a 12 and 10 year old for the most part. Errors do then creep in a little (nothing that damages the story in any way, but the careful edit from the opening scenes has backed off somewhat here). So it felt like the start of one book and the middles and ending of another. Again, I enjoyed it and actually read it over just a few days. It's got 4 stars (a great rating!) because it was good. The opening section was 5 star for sure and couldn't tell where it was going but wanted to know more for sure! Kenneth S. Harris has a B.A. in English. His passion for crafting fiction has led to the creation of his novels The Perfect Tree and Any Flavor Jellybeans but Black, and several short stories. He currently lives in Kentucky with his wife and three children. "Writing is an escape and a celebration of life, much like reading," Kenneth says. "Story telling is an essential part of the world's traditio Kenneth S. Harris has a B.A. in English. His passion for crafting fiction has led to the creation of his novels The Perfect Tree and Any Flavor Jellybeans but Black, and several short stories. He currently lives in Kentucky with his wife and three children. "Writing is an escape and a celebration of life, much like reading," Kenneth says. "Story telling is an essential part of the world's traditions and evolution. Who humanity is 100 years from now will likely be defined (at least in part) by the stories we tell."